As Allcorn Box Memorial Fund scholar, I was able to attend the BSA Medical Sociology Study Group Annual Conference. The MedSoc2017 was held from the 13th to the 19th September at the University of York. My presentation “Exploring the lived experience of fibromyalgia using Frank’s narratives” was scheduled in a big lecture theatre as part of the “Experiences of Health and Illness” stream. When I submitted my abstract months ago, nobody could have guessed how topical fibromyalgia would become: a few days before my scheduled speech Lady Gaga announced that she was suffering from fibromyalgia. 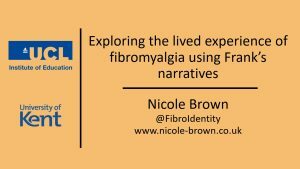 This paper reports the findings of this holistic qualitative study into the lived experience of fibromyalgia. Instead of applying a purely narrative interview approach, this pilot phase of a more elaborated piece of research used a wider range of expressive means ranging from email exchanges, interviews and conversations to an identity box project. Participants were asked to respond to specific questions using physical and metaphorical representations and objects. Data from all sources in all formats, written and pictorial, was subjected to interpretative phenomenological analysis. Three overarching themes were identified: loss, gains and the battle with fibromyalgia. Arthur Frank’s framework was used as a starting point to analyse the illness narratives of five women. The discussion demonstrates that the women’s experiences of fibromyalgia are so complex that they cannot be fitted within Frank’s existing framework of restitution, chaos and quest. The rhetoric amongst the women is one of having felt losses and gains, but mostly fighting the illness whilst still living life to the fullest in the given circumstances. It appears that the women develop a stance that is best described as combative acceptance. It is argued that the chosen methodology was key in uncovering this narrative plot. Whilst existing frameworks and methods may be helpful in gleaning an insight into some aspects of lived experiences, it is necessary to retain a constructive, reflexive openness for hidden rhetoric, such as that of combative acceptance to emerge.